This large and impressive vintage amethyst and diamond dress ring has been crafted in 18ct yellow gold. The substantial pierced decorated angular mount displays a stunning feature 17.74 carats scissor cut natural amethyst held in relief to the centre of the design. Feature hexagonal collet settings are ornamented with two fancy cut natural amethysts to either side of the main gemstone. The borders of this impressive vintage cocktail ring are accented with pear and marquise cut diamond trios to the upper and lower borders and with four pairs of eight-cut diamonds to the sides. All the diamonds are very well matched, high colour and clarity graded stones. The elevated, geometric pierced decorated shoulders integrate in to the mount and blend seamlessly with the plain 18 carat yellow gold shank. This fine 1970's dress ring is supplied with an independent diamond grading report card. 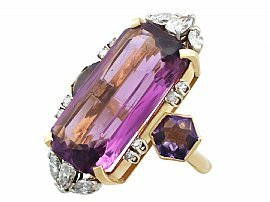 This stunning ring is fine quality, set with natural amethysts and very high colour graded, very high clarity graded diamonds.